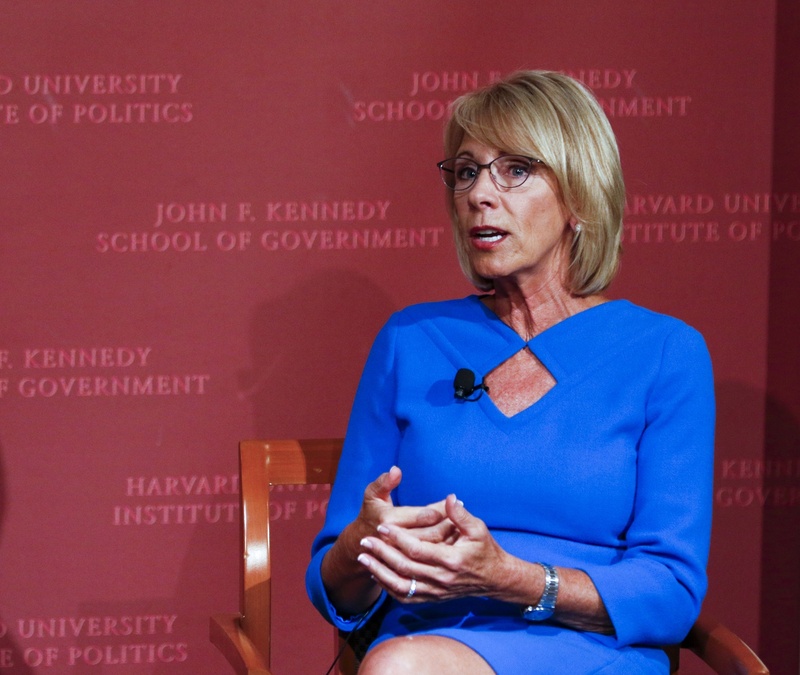 New Title IX policies the U.S. Department of Education is reportedly considering would likely force Harvard to change its policy and procedures for addressing sexual assault and harassment, according to legal experts. The New York Times first reported that the department is considering changing its policies Wednesday, though the DOE has yet to make an official announcement. The Times reported that the updated guidance would mean schools are no longer responsible for incidences of sexual harassment that take place off-campus; would change the standards for filing Title IX complaints against universities; and would apply a narrower definition of sexual harassment, among other changes. Many schools — including Harvard — based their current policies for addressing sexual misconduct on Obama-era guidelines issued in 2011. DeVos rescinded those guidelines in Sept. 2017 and offered a fresh set in their place. None required Harvard to shift its policies and the University’s top Title IX administrators pledged to stick to the old rules. Now, though, keeping the status quo may not be an option, according to experts. Colby Bruno, a lawyer with the Victim Rights Law Center, said the reported changes would require universities like Harvard to revise their Title IX policies. Unlike the Obama-era guidance, DeVos’s proposed regulations, if enacted, will carry legal weight because they will have passed through the federal rulemaking process. Bruno said the changes to Title IX rules could generate confusion on campuses across the country. “We have worked hard in recent years to develop strong and fair policies and procedures, to increase the support services available to our community members, and to raise awareness of them across campus,” she wrote. Harvard’s current Title IX policy was forged in 2014 and uses the “preponderance of the evidence” standard, the lowest legal standard of proof and the one suggested in the 2011 guidance. The new policies, however, would allow schools to choose between “preponderance of the evidence” or a stricter “clear and convincing” standard initially laid out in DeVos’s 2017 guidelines, according to the Times. Harvard's policy and procedures have drawn controversy in their four years of existence. A group of professors at Harvard Law School charged that the definition of sexual assault laid out in Harvard’s policy is inappropriate and that the University’s procedures deny due process to the accused. The professors successfully led the charge for Law School-specific procedures in 2014 — and several submitted a memo to the Dept. of Education in Sept. 2017 calling for a narrower federal definition of sexual harassment. Bruno said such a policy shift would make it nearly impossible to bring an Office of Civil Rights complaint against a school’s handling of a Title IX complaint. Harvard currently faces three OCR investigations into its handling of complaints opened in 2014, 2016, and 2017. Under the DeVos policy, schools would also only be responsible for conduct that takes place on campus or within its own programs, which would exclude off-campus parties and events. The 2011 Obama administration guidance required schools to investigate complaints even if they took place off campus. The change would mean that incidents that occur at final clubs or properties not owned by Harvard would no longer fall under the University’s purview — at least in the eyes of the government. A 2015 campus climate survey found that 47 percent of senior women who reported participating in final clubs — as members or as attendees of male final club events — reported “experiencing nonconsensual sexual contact since entering college,” the highest figure among any student group included in the data. The government would also hold schools responsible only for investigating formal complaints, which are those made to “an official who has the authority to institute corrective measures.” This would remove Harvard’s legal responsibility for incidents brought to the attention of faculty and staff via more casual channels. The new rules would also make it optional for schools to offer appeals processes and recommend schools use mediation to settle Title IX disputes, according to the Times report. The Obama administration recommended allowing appeals and advised against mediation. An FAQ document accompanying Harvard’s Sexual and Gender-Based Harassment Policy and Procedures says the school will not use mediation in cases of sexual assault. Amelia Y. Goldberg ’19, a member of Our Harvard Can Do Better, an anti-sexual assault advocacy organization, said the new policies would force schools to “walk back” changes they’ve made to Title IX policies and procedures in recent years.